Let’s talk about one of the best big bass baits on the planet, the Football Jig. They can imitate a crawfish, bream or any number of natural forage that swim or crawl in your Texas body of water. You can catch 100 bass with the same jig and only have to replace a few trailers, while if you are fishing soft plastics, you are lucky to catch 3 fish on the same bait before it is trashed. When it is a hot and sweaty summer day here in Northeast Texas, I will often reach for a Santone Pro Series Football Jig. They have a big 5/0 Gamakatsu hook and a trailer keeper on the shank. They use only premium silicone skirts and powder coated heads. I prefer the ½ and ¾ ounce models to get my jig deep fast and keep it there. These baits are also made right here in Texas. When it is a cloudy or overcast summer day, I prefer the darker colored jigs due to their higher visibility in the low light conditions. 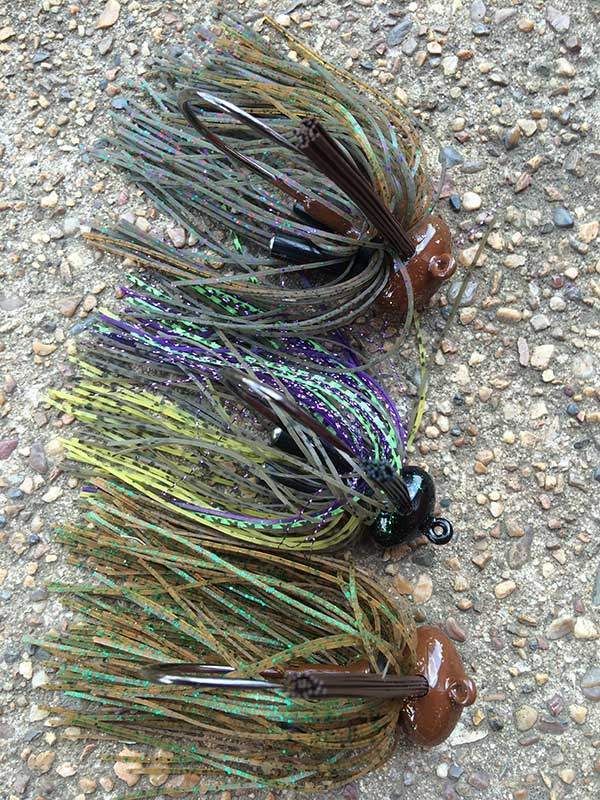 These are 3 basic DARK color jigs that are going to be highly visible in the depths that you are fishing this time of year. When it is a “blue bird” or fairly windy day, I always have some NATURAL colored jigs tied on. These baits have NATURAL color tones and can be fished at any depth and at any time of the year and consistently catch fish. The nature of the color of these baits makes them very productive on highly pressured waters, since the neutral colors closely match local forage. Here are 3 of my favorite colors. When I am selecting a jig trailer, I try and match the jig 90% of the time. The pre spawn is the only time I will use a contrasting jig trailer. My favorite jig trailers are a Strike King Rage Chunk, Baby Rage Craw and a Netbait Paca chunk or Baby Pacacraw. All of these trailers have good sized appendages that won’t over power the jig and add some bulk but still keep the bait streamlined. If I am using a natural colored Jig trailer, I will usually dye the end of the flappers chartreuse. I love the I-Spikeit dipping dyes that are garlic scented and for other applications I use the pen applicator. Let’s face it, when throwing a big football jig in the summer, we are looking for a BIG kicker bite. So don’t skimp on your gear when tying on a football jig. You will be pulling bass out of the heaviest, nastiest and thickest cover on the lake. I throw 20 lb Floro 90% of the time and if I am fishing a lot of Bois’d arc or cedar trees, I will opt for 25 lb Floro. I am not a big fan of braid to floro combinations for this style of jig fishing. That is just one more knot to fail and the braid sounds like a chainsaw rubbing limbs in the timber. I like to use an IROD 7’7” Andy’s Flipping Stick. It is a long rod that can handle a long cast and can still turn a big bass quickly out of heavy cover. I will always use a 7’3” or longer rod in a heavy action for deep football jigging. As far as the reel, I use a 6.4:1 gear ratio. It is slow enough to keep you from fishing to fast and fast enough to get that bass to the boat without your arm falling off. 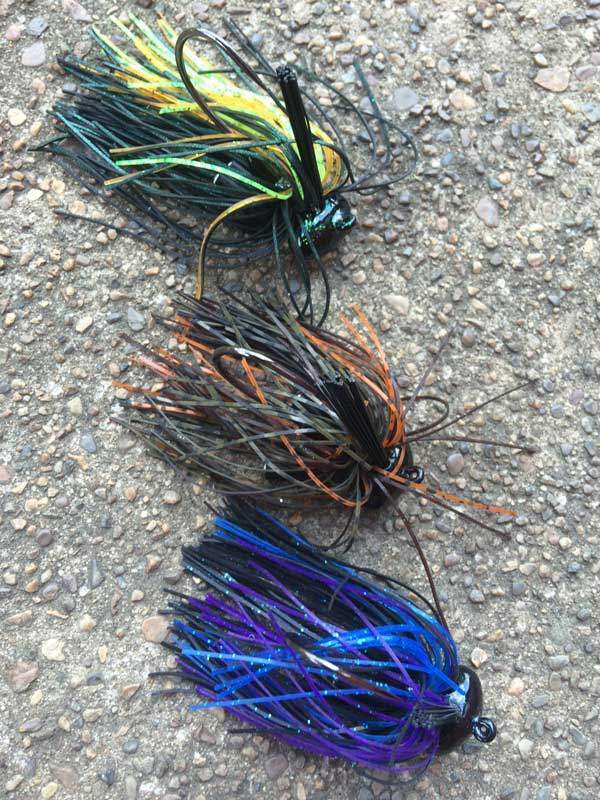 There are many ways to fish a football jig, and I am sure you have heard ideas and tips galore. My best advice is if you think you are fishing slow, slooow down some more. How many times have you set your rod down to get a drink, check a text or use the bathroom and pick your rod up and WHAM, there is a fish on? I have had this happen too many times to count. You can stroke a jig, hop it or add in your own method here. In my experience for BIG fish, I like a SLOW drag and stop technique that is almost painful. I don’t use technique when looking for fish, but after I have located the brush pile or road bed holding the bass. I hope these tips will help you out next time you are tying on a Football Jig and headed out this summer.